Science fiction, at its best, provides a canvas for armchair experimentation. Particularly for aspects of society and economics, often as influenced by technology. The author is not constrained to history or even human nature. Anything that can be justified by a chain of imaginary logic or fictional history is perfectly valid. One common theme in science fiction is post-scarcity. In essence, everyone's needs are satisfied and all but the most outlandish desires as well. It is seen as a natural consequence as manufacturing capability and energy production increase more rapidly than population pressure. In much of science fiction post-scarcity is basically assumed, e.g. Star Trek. When otherwise, it is often due to a corrupt government or hostile living conditions (Heinlein's moon colony with air rationing). Other authors make post-scarcity a central topic of the story. Ian Banks's Culture series is one such universe. Post-scarcity can be seen as the loftiest goal for society to achieve. Even Banks has a hard time imagining what lies beyond it, only really exploring the issue in eighth book of the series, Surface Detail. Throughout our own history, society tries to achieve some measure of post-scarcity where possible. Potlatch, bread and circuses, public education and socialized healthcare are fundamental examples. Occasionally these are for less than noble ends. Potlatch is about becoming a big-man in society. Bread and circuses is a Huxlian means of distracting the population. Public education creates a skilled, interchangeable and docile workforce. Regardless of intent, these are all net positives and people do not have to worry about meeting basic needs of survival. Today we are closer to true post-scarcity than we have been at any point in history. We seem to be slowly moving towards that goal, but there are plenty of forces pushing the other direction. Probably the single greatest source of damage has been due to economists. The most basic tenet of Econ101 is that profit must always be maximized. With perfect information on the market, economists can point to a supply-demand curve and say "This is what you should charge people to get filthy rich. If you don't charge this, you are crazy." Set your price lower and you are leaving easy money in the consumers' pockets. This is called economic surplus and is (according to economists) a bad thing. In a post-scarcity economy, surplus is the whole point. Everything is surplus, everything is affordable to all people. This is simply not compatible with setting prices as high as the market will bear. Maximizing profit places a drain on society that hurts everybody. This chart is the counterpoint to a supply-demand curve. The Y axis is how much profit is made. 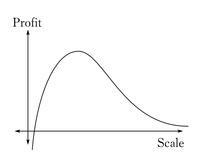 The X axis is the scale of production. There are three main zones. 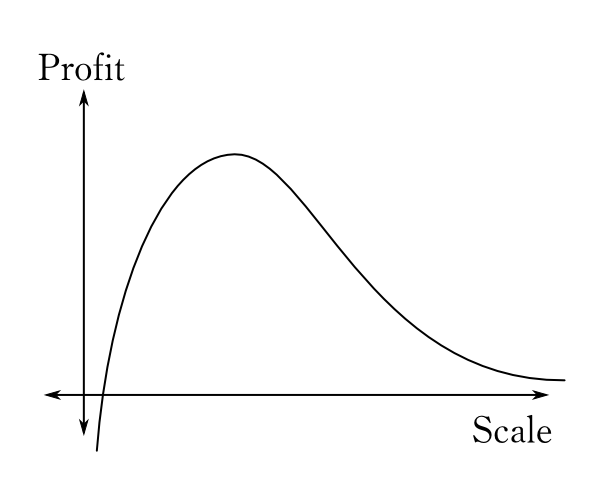 The peak in the middle is what economists think everyone should strive for, the point at which a business can extract the maximum amount of money from their customers. We will call this the zone of the Profit Maximizing Leech. At the right end of the curve we see the consequence of near infinite supply. This is where Economy Of Scale has been reached and the product is a pure commodity. At the far left end, we see small volume production that often occurs at a loss. This is area traditionally ignored by economists as no rational person would do work for free. It consists primarily of hobbyists and volunteers and I will call this zone Labors Of Love. Labor Of Love: Pretty much the entire F/OSS ecosystem is the best example here. Millions of hours of work that everyone benefits from, all done at no monetary cost. Aspiring artists and authors who release their work freely also fit into this category. Even if they charge a nominal fee for their work it still may count, because the nominal fee typically won't make up for the immense amount of effort. My favorite example is Timothy Albee's production of Kaze Ghost Warrior. Armed with only a pair of common personal computers, he lived a nearly monastic lifestyle in the backwaters of Alaska. Six months later he completed a high quality animation and more importantly demonstrated that such work was within the reach of a person with limited means. This might sound trivial by today's standards, with Blender's Open Movie Projects routinely cranking out increasingly impressive productions, but in 2004 it was quite a big deal. Profit Maximizing Leech: I'm not going to name names here, mainly because every business does this at some point of another. Most do it every day. Even with the best intentions, it is hard not to maximize profit while a company is young and trying to bootstrap into an uncertain future. Economy Of Scale: The traditional example is municipal utilities, cheap and reliable service that pretty much everyone can afford. In the past decade, the constantly dropping cost of computer infrastructure has created many services with operating costs so low they can be provided at no cost without significantly impacting a business's bottom line. Pay-what-you-want models for digital goods and services is a more recent development along the same lines. The creators could charge more, but they are already collecting enough for themselves and don't feel the need to wring the market dry. Louis CK is directly addressing exactly this problem by trying to eliminate scalpers and their "valuable" service of matching supply to demand. While entertainment has been making big splashes into a post-scarcity model, commodity goods have been becoming more affordable for decades as production is further automated. The two best examples I can think of are food and computers. Both have never been cheaper and prices continue to fall. Sadly, we can not simply place all the blame on short sighted economists. We, as consumers, encourage such bad behavior whenever we give money to leeches. Don't give them your money. Educate yourself so you can identify price gouging and planned obsolescence. Find (and recommend) conscientious alternatives. This is functionally equivalent to only buying the best deals, but now you can take an obnoxious moral high ground too. In particular, never give money to a company who will then use the profits against you. The biggest examples are companies that push DRM, remove functionality with automatic updates or sponsor anti-consumer legislation. Be willing to pay extra to companies whose ethics align with your own. Turning a huge profit is okay if the company is doing good and ethical things with the money. As always, be very informed before making these decisions. Don't get suckered by greenwashing campaigns for example. If you have time, get a hobby that benefits society. This will indirectly fight overpriced products by providing alternatives. Obviously, the GNU/Linux environment is a big example. Not everyone can write device drivers, but there are plenty of options. Traditional volunteering comes to mind. Even activities that some would contend have no practical value to society can still help society. For example, posting stupid videos on Youtube. Someone will find a stupid video to be entertaining. With any luck, that stupid video will be just enough to sate their desire for entertainment. Happy and entertained, they might not feel the need to buy a $20 movie ticket that night. If you don't that the entertainment industry is weakening Fair Use, posting a silly video keeps a few dollars out of that fight and would make more of a difference than your individual spending habits. If you have money, use your capital in socially responsible ways. First and foremost: don't be a robber baron, making people's lives miserable to maintain your position. For example, buying a competitor just so you can mothball their product. Instead spend that money on making your product better or cheaper. Of course you still want to make a profit, but it should be a minimal profit. Just enough to cover research and weather through market volatility. Don't artificially cripple your product. Don't do planned obsolescence. Above all, don't have an IPO - none of this will survive quarterly reports. Fellow SF buff and armchair philosopher here.